Our delicacies taste particularly good in the heart of the Old Town. Stroll along the Herrengasse and enjoy the unique flair of Graz, guaranteed to be kept in good memory for a long time. 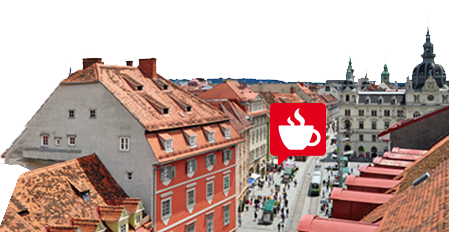 Gino Caffe is located directly opposite the Graz Main Square facing the Town Hall and just a stone’s throw away from the Graz Schloßberg. Visit us and immerse yourself in this enchanting atmosphere. A cappuccino at Gino Caffe will get your day off to an excellent start. Need a break from shopping or work? Drop by for a snack – and why not finish up with an espresso? We‘re looking forward to your visit!